HF: Lai Afong 赖阿芳 aka Lai Ah Fong, Huafang, Fang Lai, Lihua Fang, Li Fang, A’Fong Lai, 赖華芳, 黎華芳, 芳華 c.1839 – 1890 was a Chinese photographer who established Afong Studio, one of the early photographic studios in Hong Kong. 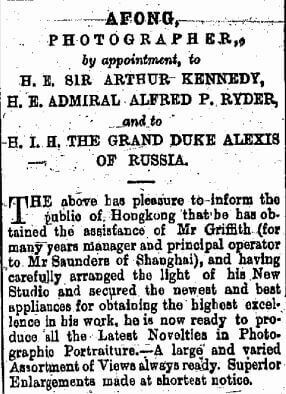 In the 1910 Hong Kong Directory and Chronicle A Fong’s Photo Studio is listed as at 31, Queen’s Road Central, above Watkin’s Dispensary. 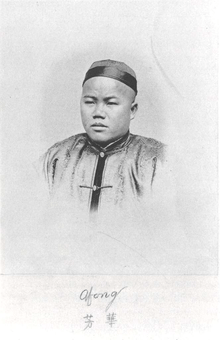 A Fong, photographer, H.A. Rosario, managing clerk. The Dictionary of Hong Kong Biography has an article about Lai Afong written by May Holdsworth: “On a visit to a Chinese studio in Hong Kong, John Thomson saw a number of painters ‘at work producing large coloured pictures from small imperfect photographs’. While some artists copied from photographs, however, there were others who combined an observant eye with enough commercial flair to work as photographers themselves. Many of them had studios clustered around Queen’s Road. Of these, Thomson commended Lai Afong, who was the most successful Chinese photographer of the time. 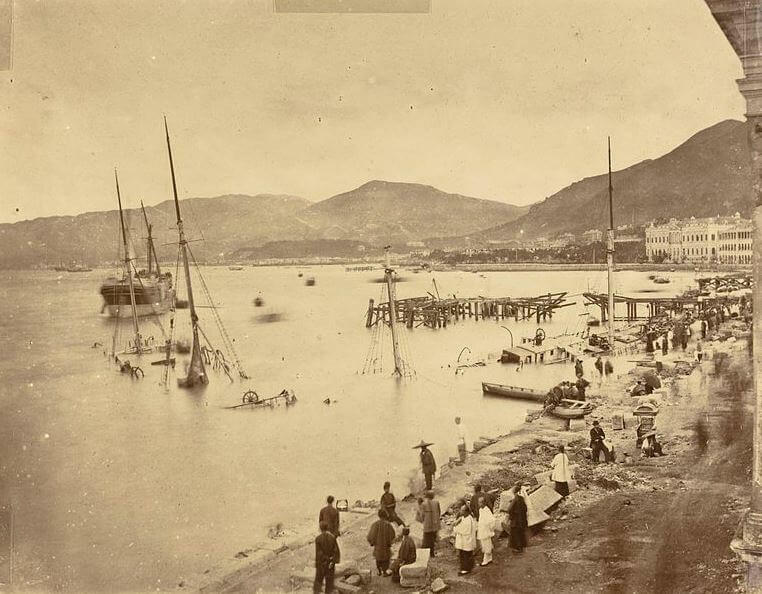 ‘There is one Chinaman in Hong-kong, of the name Afong, who has exquisite taste, and produces work that would enable him to make a living even in London.’ Some of Afong’s pictures, Thomson said, ‘besides being extremely well executed, are remarkable for their artistic choice of position. In this respect he is the only exception to all the native photographers I have come across during my travels in China’. From the extant photographers, it appears that Afong’s style differed little from that of Western photographers, which may explain his success with his European clientele. He claimed to be photographer ‘By appointment to H.E. 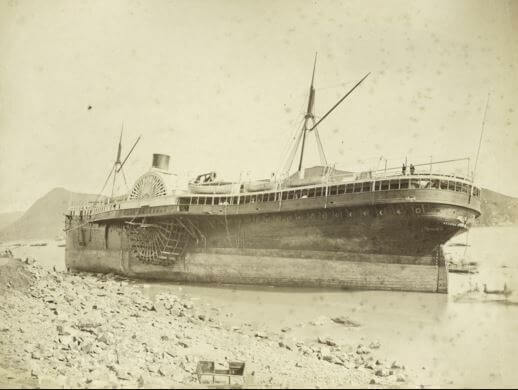 Sir Arthur Kennedy, Governor of Hong Kong’. He employed a Portuguese to look after his European customers, and was for a time in partnership with a British photographer, D.K. Griffith. 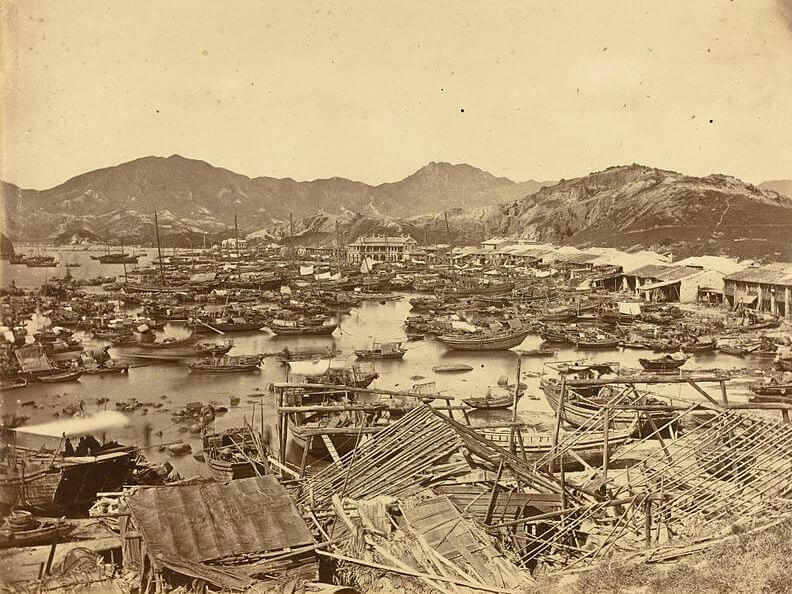 It is thought that he bought most of his stock, including collections of negatives, of the studios run by itinerant photographers who had tried briefly during the 1860s and 1870s to ply their trade in Hong Kong. This article was first posted on 1st March 2016.